Leeds United’s new head coach, Steve Evans, wants fans to give him a chance as he aims to revive the club’s faltering start to the new season. Evans will be officially unveiled at a press conference tomorrow, but has been confirmed as the man to take over from Uwe Rosler, who was sacked today. The former Rotherham United boss has signed a rolling contract until June 30 and took training for the first time this morning. Evans will be assisted by former Swansea City midfielder Paul Raynor, who he has coached alongside throughout his managerial career. He said: “I’m honoured and proud, but the supporters just want to see what happens on the pitch. “The first thing we need to do is win some points and win some football matches. “We’ve got two tough games in the next six days. I know it’s seven months since we won at home and that is something we need to get off our back. “But, more importantly, we’ve now got two away games and that is important in isolation. The first thing that matters is at Fulham. 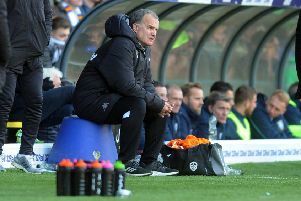 “All I can ask the Leeds United supporters to do is to give me the benefit of the doubt. Perhaps I wouldn’t be the chosen manager for many Leeds United fans - I had butterflies in my stomach driving into Thorp Arch this morning. “I can understand why they may think that, but the only thing that matters to me is what happens on the grass.